Do you have questions about your transit advertisement? Below are our top ten frequently asked questions. Contact our team if you have more questions. Shifts in consumer behavior show that consumers turn to social media platforms to discover more about products and services. This has created an opportunity for brands to create a greater connection with their target audience. Marketers are using various advertising channels to direct consumers to their social media platforms in an effort to build a stronger consumer and brand relationship. Transit advertising has a strong advantage over other platforms in trafficking consumers to social media. These large format ads are like moving billboards. Their large eye catching presence engages consumers when they are on their daily commute, near major shopping centers or riding public transit. Transit advertisements also engage consumers when their mobile device is near. 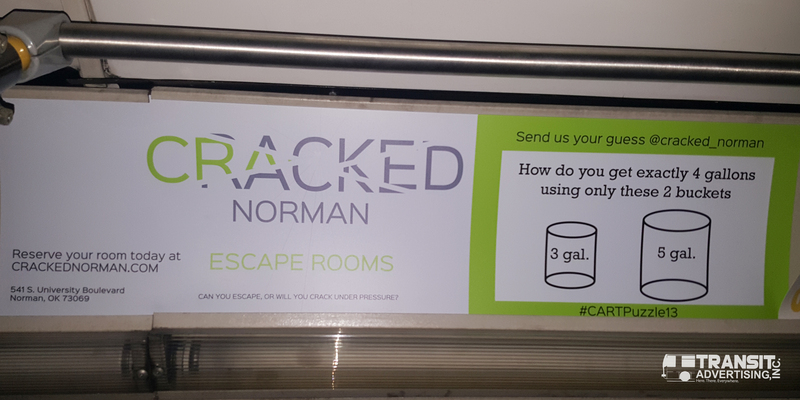 Our client, Cracked Norman, created a strong social campaign that connected users to the business’ online platform. We put together a list of benefits created by campaigns that build social connection. As you can see, their interior card ad asks a question and encourages riders to share their response on Instagram or Twitter. Their ad creates a social connection that creates greater brand awareness across advertising platforms. This creates an opportunity for Cracked Norman to engage with consumers and move them toward booking an escape room experience. Engaging with a brand on multiple platforms allows consumers to build brand familiarity that reduces hesitation. Cracked Norman’s creative and connection building interior card campaign allows the brand to go beyond brand awareness. Not only does the advertisement connect with consumers over multiple advertising channels, it connects the consumers to the brand. This allows the brand to create multiple touch-points with the consumers. Multiple touch points guarantee that consumers will see brand messages more often, with repetition. Transit advertising can be a strong catalyst for creating social connections. Transit ads have motivated consumers to post images and connect with brands on social media. This opens an entirely new channel of promotion. Consumers that post, tweet or gram about your brand are advertising for you. Today’s consumers seek connection and familiarity before they are ready to buy. Transit advertising’s high frequency ensures target audiences see brand messages enough times to build familiarity. When this is paired with a strong call to action, brands can connect with consumers and move them closer to a point of purchase. Social connection allows brands to create a direct line of communication with their target audience. Transit advertising campaigns that build social connection are only one of many ways this platform can be used. Contact our team today to learn how transit advertising can transform your strategy. How Do The Right Ads Reach Me? When your vehicle breaks down, doesn’t it seem like car repair ads are everywhere? How convenient that car repair companies advertise right when you need their service! The truth is, things aren’t that simple. Strategic steps were taken to ensure the right message reached you in your time of need. Below, we’ve answered a few questions to help you understand how ads reach you when you need them most & how to replicate this for your own business. Why Do I See Ads When I Need Them? It may seem like the right ads appear the minute you need them, but the ad you heard or read was really part of a larger advertising strategy. Car repair companies don’t advertise the moment a person needs repairs. Rather, they have an advertising strategy that increases their brand awareness and reach throughout the year. This annual strategy ensures their ads are on the right platforms to reach the correct audience. While elements of seasonality within an industry can create peak opportunities for advertising, brands with top-of-mind awareness utilize advertising campaigns that reach consumers all year long. How Do Businesses Create Advertising Strategies That Work? Advertising strategies that work include the right platform, the right message and the right frequency. The right platform allows businesses to successfully reach their audience without being ignored. The platform’s audience should correlate with that of the business. The right message speaks to consumer needs. That’s why ads about car repair seem to be everywhere when your vehicle breaks down. The most crucial part of a campaign is frequency. Businesses can choose the correct platform and message, but if the ad doesn’t run long enough strong results may not be achieved. Many companies will test advertising platforms without giving the campaign enough time to generate results. Brands in highly competitive industries utilize long-term campaigns in order to influence top-of-mind awareness. In other words, they want you to think of their brand first when you are in need of the product or service they provide. Platform, ad message and frequency ensure the right ads reach consumers. How Can My Brand Reach Consumers In Need? It is important to consider where your competitors are and where they are not. Most of today’s big brands heavily use online ads and social media. This creates a strong opportunity for businesses to take over out-of-home media. Consumers cannot ad-block transit advertisements. Transit advertising generates high frequency. This ensures consumers in your local market see your ad multiple times. Consumers remember ad messages when they are exposed to the advertisement over and over again. Transit advertisement cannot be ignored when the correct imagery and message are used. Businesses can use transit advertisements as a stand-alone campaign. They can also be part of a larger strategy that uses traditional media, online ads and out-of-home media. If you have questions about transit advertising, contact our team today. One of our representatives will lead you through a strategy that can increase your ability to reach consumers that need your product or service. https://transitadvertisinginc.com/wp-content/uploads/2017/03/Cover-Image.jpg 601 900 Samantha https://transitadvertisinginc.com/wp-content/uploads/2015/09/TAI-340x87-300x77.png Samantha2017-03-14 21:13:032017-03-14 21:20:20How Do The Right Ads Reach Me? In a sea of interruption media, brands must figure out how to be seen without being forgotten. Promotion is a key part of building a brand, but reaching consumers is becoming increasingly difficult. So, how does a brand increase market share and reach consumers? Brands increase market share by utilizing the right platform to increase the recall of their advertising messages. A central benefit of transit advertisements is that consumers do not see transit ads while in pursuit of other information. This means consumers are not eager to swipe away transit ad messages. Transit advertisements are easily seen. Their size, frequency, placement and movement make them more memorable than advertisements on other platforms. Movement triggers memory. Consequently, it’s easy to see how moving ads increases the recall of brand messages over other mediums. Transit ads are like moving billboards that travel 14 hours a day. The large image and message stick with viewers when designed with a target audience in mind. Transit ads are simply too big to be ignored. Not only, do transit ads have better message recall they are close to a point of purchase. Target audiences view transit ads while they are out. Exposing consumers to your brand message while they are in route to making purchases increases your sales opportunities. Transit advertisements receive 250K to 350K impressions per week. Consumers see transit ads multiple times during their commute. This repetition allows buyers to easily remember brand messages. Transit ads localize brand messages. Target audiences view transit ads in traffic on daily routes, in key neighborhoods and with great frequency. This gives advertisers the opportunity to engage with their target audience at a resident level. Localized brand messages create a personal impact. Budget cuts frequently mean advertising is the first thing to go. Many business owners feel like they can’t afford advertising when sales are down. The truth is they can’t afford not to promote. The sales hole grows deeper when advertising budgets are slashed. Reconsider cutting advertising when sales are down. Instead, look for cost effective solutions to continue reaching target audiences. One method of increasing sales is gaining new customers. Cost effective channels allow you to continue reaching prospects in an effort to increase sales. Transit advertising allows you to display multiple large format ads for the cost of one billboard. Low cost per impression allows your business to reach local prospects with high frequency. Consumers see transit ads during their daily commute, in key shopping areas and major districts of town. The ability to remember a brand message increases the more times the ad is seen. Transit advertising allows you to increase phone calls, web searches and influence consumer behavior by keeping your message top-of-mind. Not only is transit advertising the most budget friendly form of large format advertising, it saturates your local market and breaks through interruption media. Transit advertisements create greater exposure and savings as they receive up to 350K impressions per week. When sales are down, brands should increase positive top-of-mind awareness to influence consumer behavior. Top-of-mind awareness leads consumers to seek out more information from the brand they think of first. Markets saturated with brand messages and problem/solution advertising leads to high brand recognition. Strong long-term transit ad campaigns carry businesses through dry seasons by influencing brand awareness and increasing local market share, which often leads to delayed conversions and sales. Transit advertisements can also influence revenue through flash sale ad messages. These short campaigns flood local markets with urgent messages and strong calls to action. Become cost effective when sales are down. Don’t cut. Reaching consumers at home has become increasingly difficult. Consumers use ad-blocking software, are cutting cable subscriptions and favor DVRs over regular programming. Successful brands are responding to consumer behavior by creating advertisements that blur the line between ad and visual art. They key to reaching consumers from home is creating brand messages that consumers can’t click away, avoid or delete. Para-transit buses go outside of normal bus routes to pick up and drop off the disabled. Therefore, brands are able to target home owners, renters and riders. The benefit of para-transit ads is their low cost and ability to reach coveted advertising space, consumers’ homes. Para-transit ads are popular choices with health care, insurance and public awareness campaigns. Small businesses, such as home repair and landscaping companies, also commonly use para-transit ads to reach residential areas. Advertisers can choose from taillight, curb and street side para-transit ad space at a lower cost than fixed route buses. Furthermore, as consumers become increasingly disengaged with interruption media, consider placing your brand message on a moving billboard that reaches consumers from their front yard. Have you noticed that large companies, like Target, will have different ads for pregnant women, college students and the elderly? These are segmented brand messages. Each ad speaks to the needs of a unique group of consumers. Do you know if your target market is made up of multiple segments? Knowing can completely change your advertising strategy. Segments can be categorized by age, needs or lifestyles. Successful advertisements speak to the needs of your target audience. Ads that speak to the unique needs of each segment are more powerful and often yield better results. Transit advertising campaigns are a highly cost effective method of saturating your market with segmented brand messages. This unique out-of-home platform is like a moving billboard that travels 14 hours a day reaching 250K to 350K impressions per week. The high frequency of transit advertising allows your brand message to stick in the minds of consumers as ads are seen multiple times without distraction from other media. From 2014 to 2016, United Way utilized transit advertising to reach multiple segments of their target audience. Each side of the bus was unique. Designs were focused on brand messages and related to the unique needs of specific segments. United Way has maintained the multiple message strategy for two years with a different design for each year. This frequency has helped the company increase the reach and familiarity of their brand, while the updated designs helped their message stay relevant. This has allowed United Way to improve on their design and messaging from one year to the next. Segmenting your audience allows you to measure different levels of demand and better understand your consumers. This allows you to create messaging that these unique groups are more likely to respond to. Connect with your target audience by saturating your market with segmented brand messages. Crowded industries produce lower prices and the competition can breed attack ads. Aggressive advertising isn’t necessarily the answer to converting your competitor’s customers into your own. Many businesses turn to online media in order to reach their consumers. However, this once revolutionary idea is making consumers increasingly numb to banner ads. While social media and web advertising may have a place in your marketing strategy, don’t get lost in the clutter. In order for consumers to choose your brand over competitors, they must connect with your product or service. Tailoring ads to your target market’s interests creates connections that influence purchasing behavior. Utilize data to better understand the purchasing behaviors and lifestyles of your market before creating your targeted messages. Creating quality ads with impactful messages rather than advertising on all mediums available produces greater results. Ads with powerful creative and a targeted message will receive more traction than a multitude of ads that don’t catch the eye of your target market. Out-of-home ads, such as transit ads, are hard to miss. As online ads continue to oversaturate the web and are increasingly blocked by user preferences, there is more incentive for brands to take their advertising to the streets. Be seen with transit advertising. Why do customers come into a store, make a purchase and not know why they purchased the brand they selected? Maybe it’s happened to you. You shop at a store or purchase an item that you didn’t have a plan to buy. But when you saw the product, the purchasing decision seemed like something that didn’t need any further thought. This type of experience has many names in marketing but let’s keep it simple and refer to it as the power of a brand. Brands develop affinity power because advertising, experiences and the stories that combine the two, stimulate a purchase decision. Good advertising tells a story. We see a problem (villain) and are introduced to a solution (hero). And yes this can happen in transit advertising. The key to building a brand using transit advertising is in the marriage between words and images. With transit, advertisers have the opportunity to tell a story that creates an immediate emotional response. The story is told quickly and with great repetition. There’s nothing quite as good as living a good story again. Let us help you tell a story that causes customers to purchase a product because the story touched a felt need.